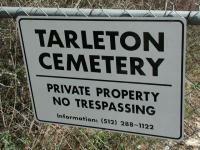 Tarleton is a small cemetery on private land that is almost surrounded by Barton Creek Mall. 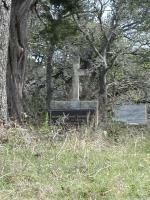 Because it is on private property we could only get a couple of shots of the cemetery from the gated entrance. A sign on the gate provides a phone number for more information, but little else. From the entrance there does not appear to be very many graves in the cemetery, but the plots lay on a small hill overlooking the entrance, which may hide some other resting places out of view. During our visit there was a steady stream of cars pulling into the entrance drive that snakes around the cemetery into Barton Creek Mall. Just 30 feet from the gate cars sped by along Capital of Texas Highway. 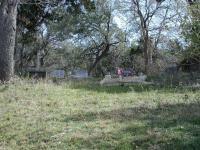 The constant noise and motion gave little indication that anyone could achieve any sort of rest here, but then this cemetery was first used long before the larger hill to the north east became one of Austin's major shopping areas.